The Tune Saver is a backup power source for your car's computer so it will keep it's memory if the battery dies or is disconnected. Designed for a Turbo Buick, but could be used on other cars with tweaks to the wiring. 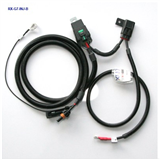 Fuel pump wiring upgrade kit (hotwire), increases voltage at the fuel pump to supply more fuel. Replacement injector wiring harness for the 1986-87 turbo Buicks.